Impressively sited on a lush corner lot, elevated high above coveted Hudson Avenue, rests the ultimate Hancock Park estate. 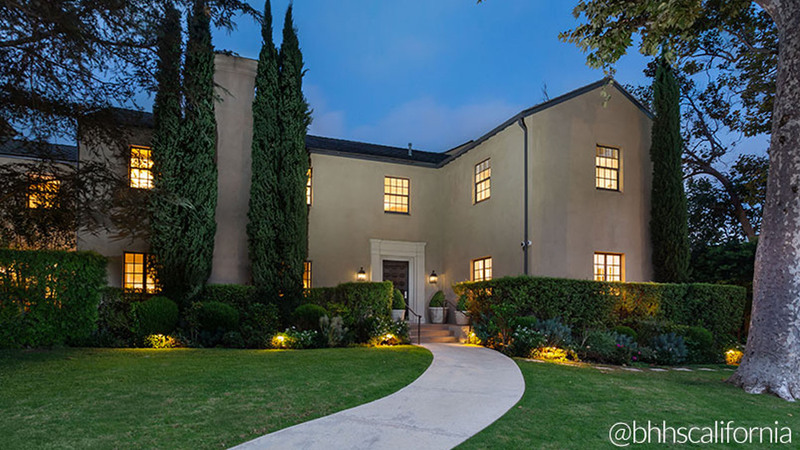 The six-bedroom, nine-bathroom home has gained celebrity status since hitting the market, with The Wall Street Journal and Los Angeles Times reporting that it is owned by television mega-producer and screenwriter Shonda Rhimes. It is offered at $9.995 million, presented by Beverly Hills agent Ed Solórzano. The traditional-style home has a modern flair, with a classic center hall floorplan, recessed lights, coffered living room ceiling, and crown molding. Spacious public rooms, a formal dining room, a sprawling master bedroom, library, and music room make up the 8,300 square feet of elegant space. The chef’s kitchen features a large island peninsula and opens up to a spacious family room, creating a spectacular great room that is the heart of the home. Sitting on just under a half-acre lot, the home is surrounded by hedges and mature sycamore and elm trees, a swimming pool, lawn, and detached cabana. The grounds are entirely walled and gated for maximum privacy. Rhimes, known for creating hit TV shows such as “Grey’s Anatomy” and “Scandal,” and as the executive producer for “How to Get Away with Murder,” penned screenplays for many of her shows in this very home. In addition to having a distinguished Hancock Park address, the next owner will be in the presence of some true Shondaland magic.